A Gluttonous Cat in the Kitchen. This is quite a random sunday afternoon post. 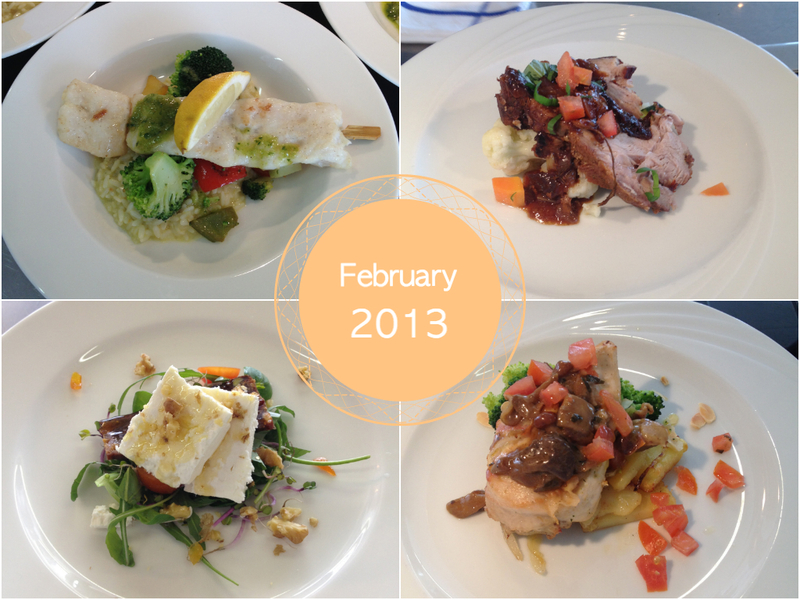 I have been "collecting" photos of most of the "amazing" creations we cook in kitchen class. Now some of those things look a bit peculiar but I put my hand in the fire (Maybe just an italian saying... uhm..) that everything tastes delicious. I wish I did those month per month.. well I will do now for my last 2 months. I must say that I thoroughly enjoy kitchen class and I was considering taking a culinary path here at school but honestly I can't see myself in the kitchen, I enjoy cooking yes, baking too but working in a kitchen full time.. hell no ! Let cooking stay a hobby ! Top Left: Risotto with spring green pesto, roasted vegetables and pine seeds, beef. Top Right: Black Forest Gateaux. Bottom Right: Lamb stew, green beans and swiss rösti. Top Left: Pangasius skewer on rice with vegetables. Top Right: Pork roast stuffed with plums on cauliflower. Bottom Left: Feta on salad with nuts with lemon truffle oil and fruit bread. Bottom Right: Some meat (sorry..chicken?) on french fries, broccoli with mushroom gravy. Top Left: Beef Stew on Rice Pilaf with peas and watercress. 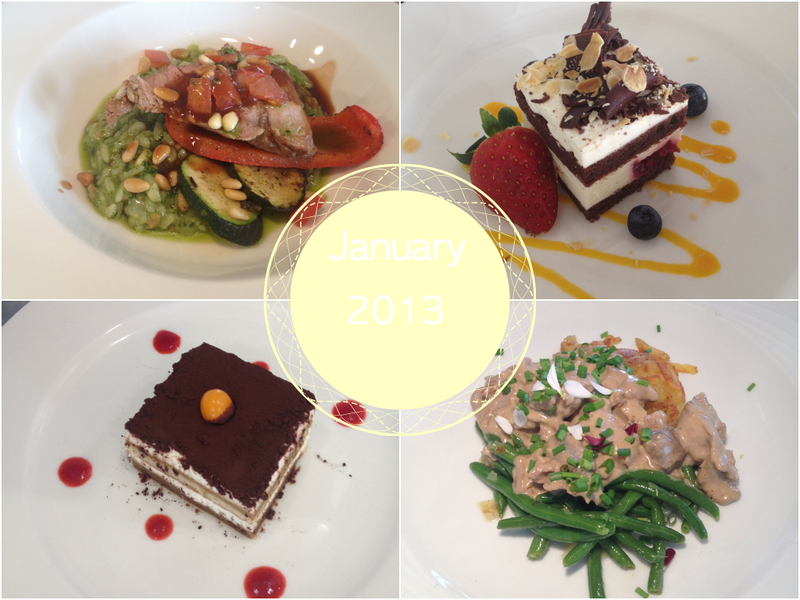 Top Right: Beef on green beans with roasted tomato and mushroom cream sauce. Bottom Right: Beef carpaccio with lemon oil, parmesan and watercress. Hope you enjoyed this culinary intermezzo on my blog :) More to come soon.. well.. end of the month roughly. 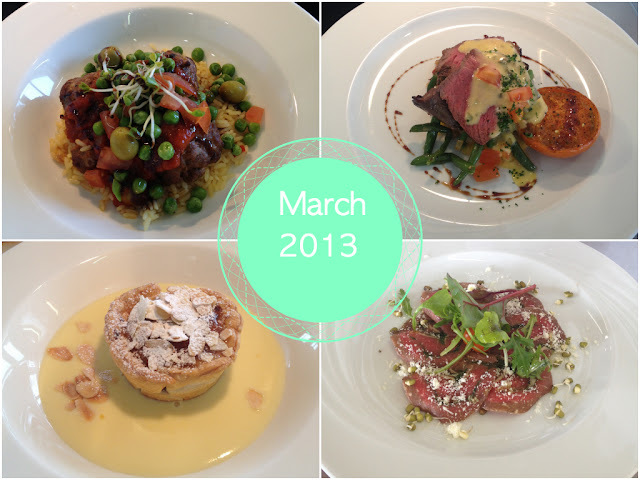 Since I'm on a culinary scholarship you might see some more food sooner than the end of April. Stay tuned.